OpenGL Volume Draw menus can have utilities drawn in the 3D and exported to DXF for import to AutoCad software. GPR-SLICE survey of the Nutubaru burial mound in Miyazaki, Japan with time slices displayed in shaded color. 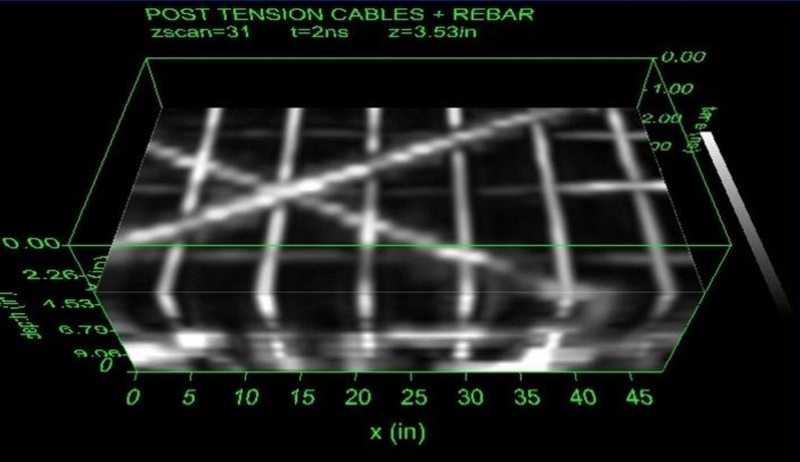 GPR-SLICE imaging of concrete structures with post tension cables and rebar. GPR-SLICE is integrated with every manufacturer for GPS for seamless integration and interpolation across GPR/GPS tracks. GPR-SLICE survey of a mound using real time topographic warping of radargrams, topo depth slices and topo warped isosurfaces. !! Take advantage of the multiple processors on the computer for super fast operations !! GPR-SLICE version v7.MT with MultiThread Processing is now being delivered on the Subscribers Only page. Take advantage of the multiple processors on the computer for super fast operations!! GPR-SLICE v7.MT (1994-2019) is a comprehensive ground penetrating radar imaging software designed for creation of 2D/3D subsurface images for use in a variety of geotechnical, engineering and archaeological applications. GPR-SLICE began development in 1990 and became a full commercial software by 1994. The first Windows version of the software was released in 2001. The software is directly marketed by the Geophysical Archaeometry Laboratory Inc. and our affliated worldwide distributors. GPR-SLICE applies a unique process of radargram desampling/binning and then recreates GPR data volumes using estimation algorithmsfor single channel - coarsely spaced profile lines. For multi-channel dataset direct compilation to pulse 3D volumes can be quickly generated without interpolation because of the hi-density acquisition. 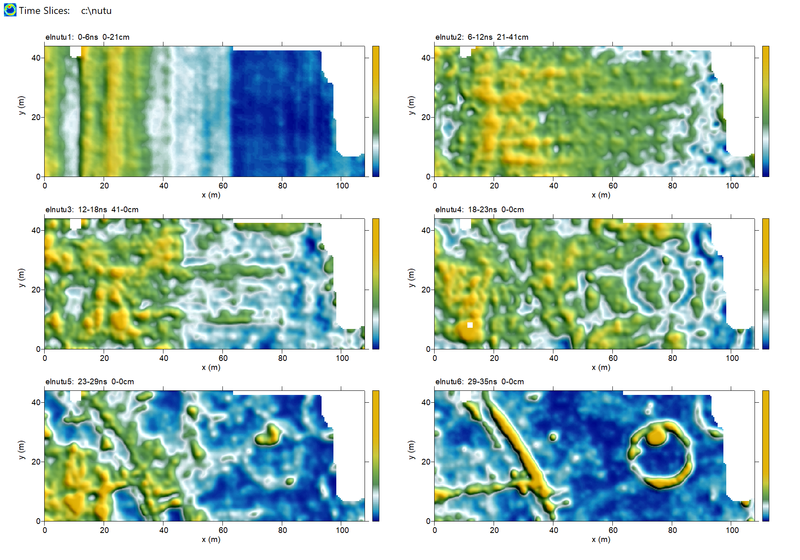 GPR-SLICE handles all surveyed data densities to make the most comprehensive subsurface imagery. Many researchers have migrated to the software because of the professional quality images that can be created in the software. GPR-SLICE software is designed to remove line noises and artifiacts that show profile directions and pixelation noises from incomplete sampling of the ground. GPR-SLICE images help interpreters extract hidden information contained in noisy radargrams which would otherwise be lost and never revealed within the raw data. 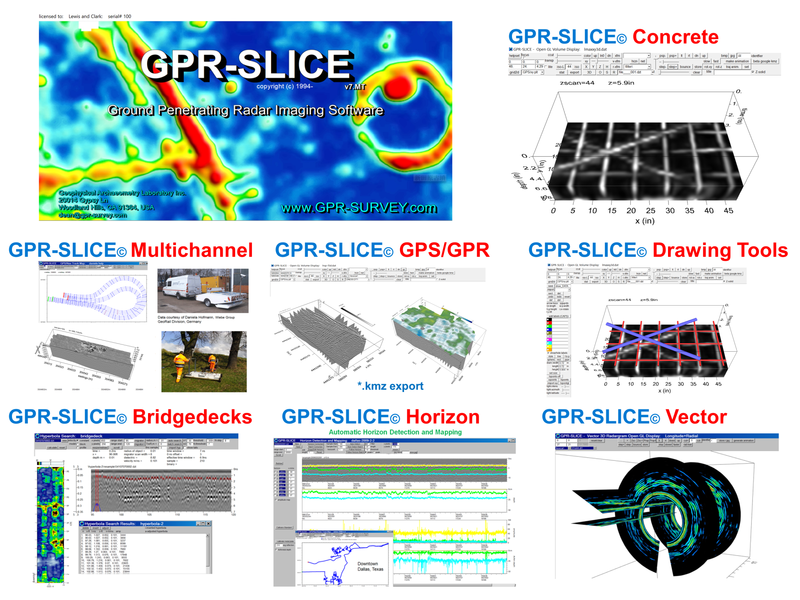 GPR-SLICE was the first commericial software in 2003 to release complete integration with GPS navigation, including GPR/GPS volume imaging and time slices. The software is completely integrated for GPS with all the major manufacturers of GPR. GPR-SLICE is integrated for Total Station navigation where the typical GPS NMEA string formats are used. GPR-SLICE was the first software to provide for static corrections that account for the tilt of the antenna over sites with topography. 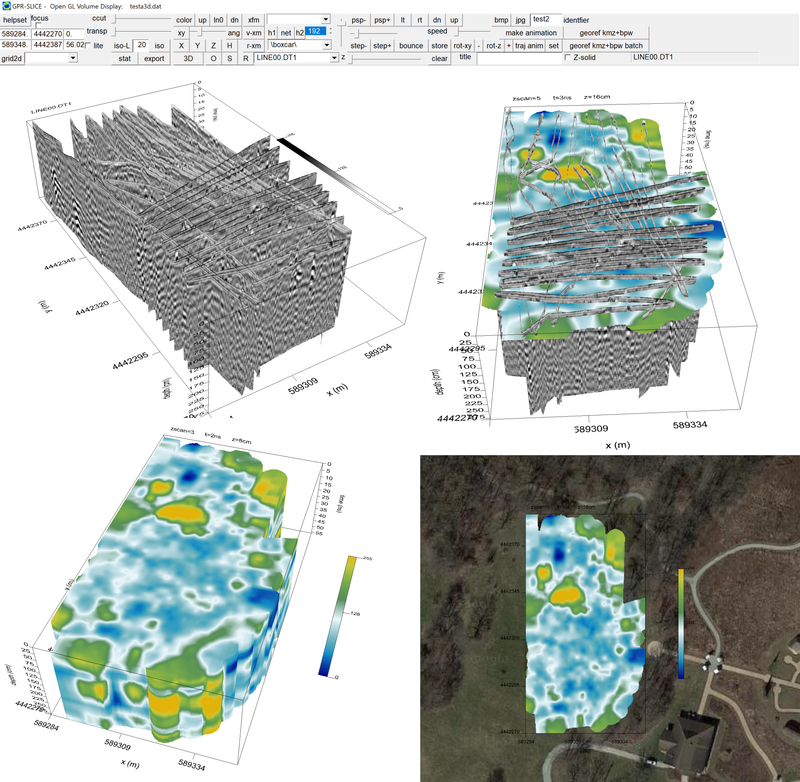 GPR-SLICE has a unique overlay option, which provides for comprehensive subsurface maps that synthesizes structures located at different depth levels. Civil engineers that are surveyors of infrastructure can use features in GPR-SLICE to image tunnels and present 3D slices of tunnel or cylindrical volumes. With the addition of our built-in OpenGL 3D Modules GPR-SLICE Open GL Volume, real time flythroughs, real time isosurface rendering, transparency and fences yield dynamic displays of GPR-SLICE data volumes. 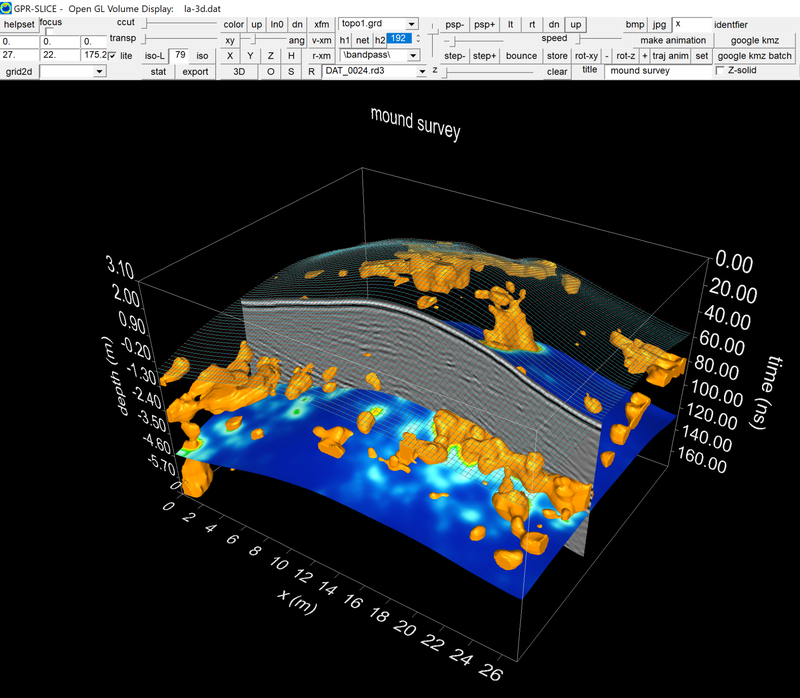 GPR-SLICE includes built-in Open GL options for mixing of 3D time slice volumes, isosurfaces, horizon surfaces with raw or processed radargrams in the same graphic dialog. GPR-SLICE has complete Vector navigation formats - random GPR tracks + the yaw, tilt and pitch of the antenna are all included in the most generalized navigation. Vector navigation is all inclusive of the navigation for regular surveys, GPS, total station navigated surveys, any navigated survey - but with the antenna orientation. What this means is that any survey of a GPR antenna in 3D space can be mapped and the radarscans projected into their proper location. GPR-SLICE v7.MT is the first commercial software to provide for vector imaging which had its first introduction in 2009. GPR-SLICE has been providing support in the software for 4D GPR monitoring. GPR monitoring is fastly becoming an important market in GPR surveying to reoccupy sites and to determine the differences in time that have occurred. GPR monitoring of runaways, railway systems, and other critical infrastructures are getting noticed by the engineering community. GPR time slice differencing since 2003 and recently volume differencing for 4D measurements have become available in 2015.
one button click macros from raw data to radar signal processing to image processing and final 3D volumes! 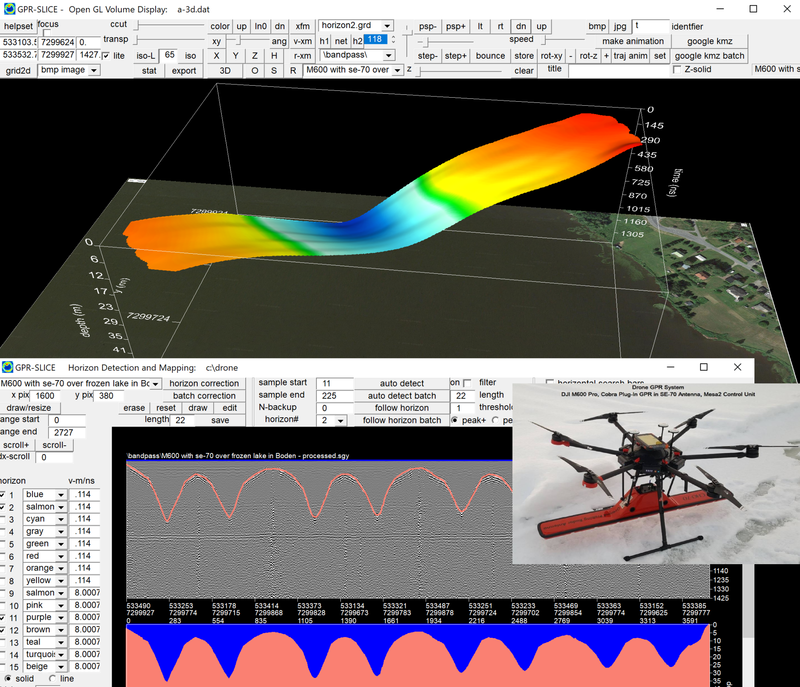 Magnetometer, Resistivity, EM data and any 2D/3D data.